Everyone kind of thought that digital nomads were lying. Surely it couldn't be that easy to slot working and travelling together? But now, everyone is doing it. If you work remotely, you’ll be familiar with the look some cafe staff give you when you ask for the WIFI password. And let’s not get started on the coffee mission. The arduous task where you sip your bevvy as slowly as possible, so you don’t feel like a free rider. In short, sharing your office with the general public is hard. But co-working spaces is where the honey is. They’re comfortable, built to serve all your needs and are freaking cool. Plus, they’re filled with people who get you and what you need. So, if you find yourself in some far-flung location and want to ditch your hotel’s four walls, you're in luck. Setting up your laptop in a communal office is easier than ever. 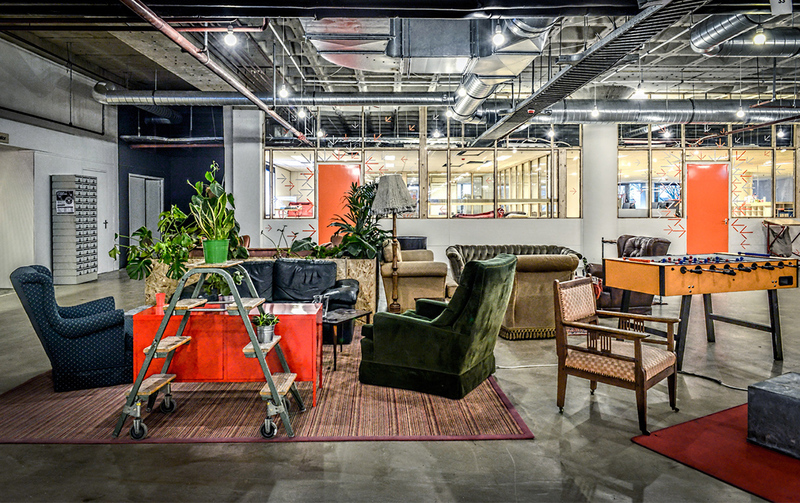 Here’s our pick of the best co-working spaces across the globe. This bustling hot-spot in Canggu is open 24/7. You’re also welcome to splash in their pool and nibble on local delights from the cafe–win! 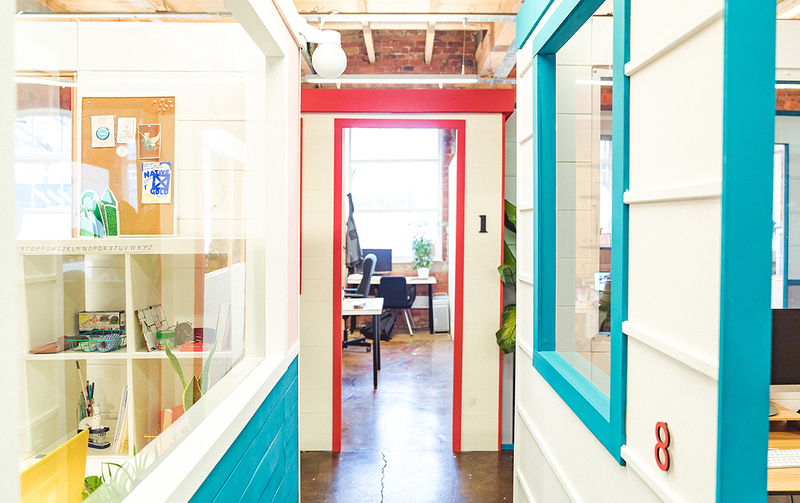 Anyone who’s co-worked at Dojo will tell you that it’s one of the best co-working spaces across the globe. And we love that Aussie Michael Craig founded it. It's the most affordable co-working space on the list (about $270 for unlimited monthly access). Ridiculously instagrammable, community vibes on steroids and adjoining accommodation make this a good'un. Dojo is a must any travelling worker. If a treehouse and a doll house had a love child, Duke Studios would be it. Fall for this cute as a button spot, scattered with candy coloured walls, mismatched desks, eclectic rooms and artsy knick-knacks. For the creatives (or those who need a hand), these guys even offer vinyl, design and building services. 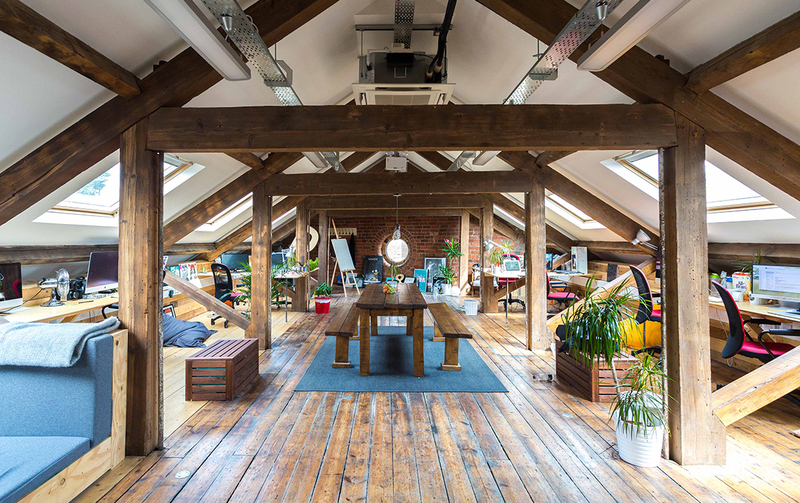 At Duke Studios’ co-working space you’ll find the likes of photographers, film makers, DJs, illustrators and architects, so you’re guaranteed to be in good (and talented) company. Oh and their resident pup Mr Scruff is on call for cuddles. Kooky cool spaces designed to inspire and ignite your creative spark? Yes, please. 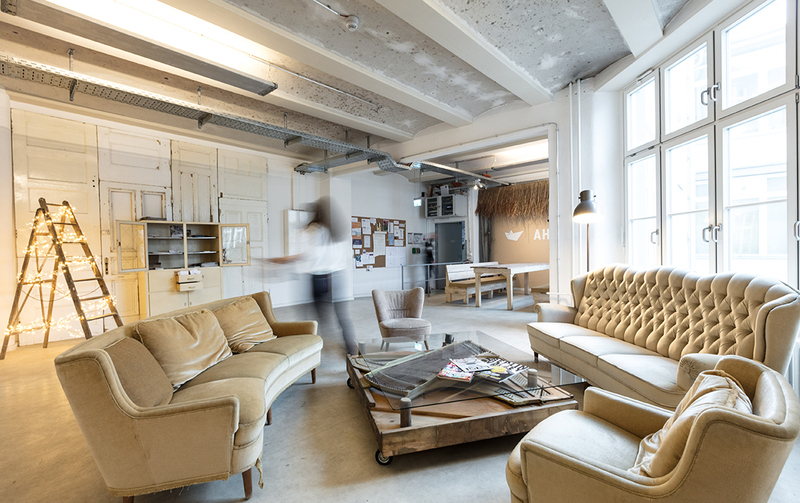 Utopic have thought of everything and this may be your favourite new co-working space of all time. Well, if Spain is on the cards for your next business trip that is. Bountiful flora, geometric flooring and private nooks. 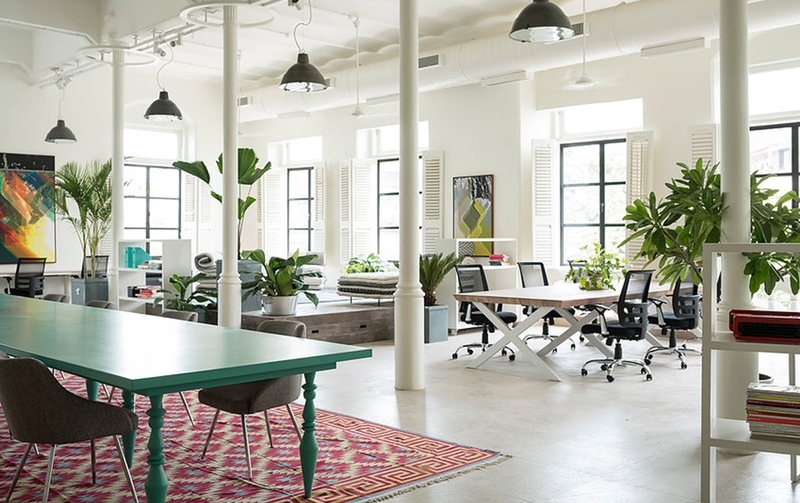 Seating options range from sun chairs (yes, like on holidays) to cozy cushion-lined booths and desks—the co-working world’s your freaking oyster. They also have rooftop yoga sessions, live DJs and booze, ‘cause it’s all about that work/life balance right? For some of us, travelling to India can’t be all camel riding, sightseeing and soul searching. What a shame. On the plus side, there’s an epic spot to transform into your new office in Mumbai. Enter: Ministry of New. Co-founders Marlies Bloemendaal and Natascha Chadha were sick of uninspiring, daggy work spaces. So they created a bloody ripper co-working one to fill the void. The renovated factory is light and airy with you-know-its-from-Morrocco rugs, casual swings and blankets.Yes, blankets. They even have yoga sessions on Mondays and Wednesday. Does it get any better? Oh there’s also a photographic studio on site, so it can become your one-stop-shop for all things creative. The gals at The Wing are bringing a whole new tribe of femininity to the co-working world (sorry boys). Fall head over heels for this women’s only co-working space with a killer vibe tribe waiting for you to waltz in. We’re dubbing it one of the best co-working spaces across the globe, for the wonder woman in each of us. Minimalist pastel interiors, book lined walls and plenty of empowering events (featuring kick-arse speakers like Hilary Clinton and Jennifer Lawrence!) on offer. 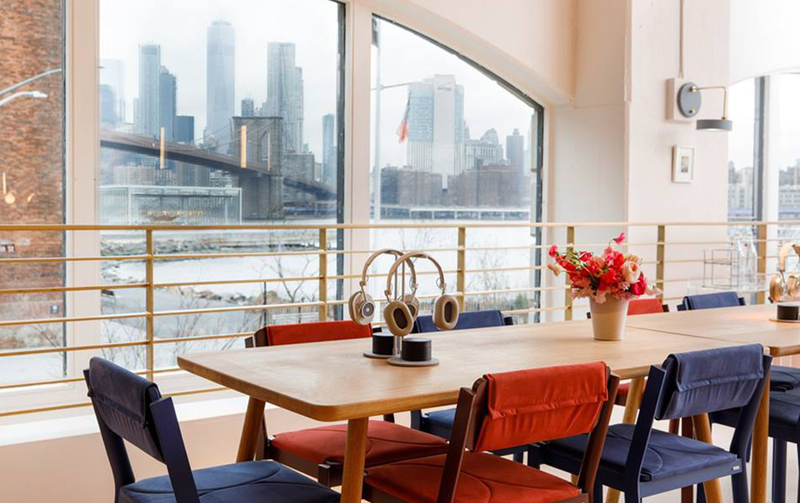 They’ve got three stunning spaces in NYC and digs in DC, with spots in San Francisco and West Hollywood to open later this month. Half hipster-hideout, half industrial-productivity-central, we’re getting all the feels for the moody East Room. Picture this: vintage leather couches, marble-top kitchen benches and private meeting rooms worthy of a dinner party. It’s the swankiest co-working space we’ve seen. Your next trip to Canada even comes with a spot to cook your maple bacon and pancakes and they have live gigs with awesome emerging artist on the regular. Winning! You’ve finally gobbled down authentic paella, oggled some castles and caught a footy game. But now it’s time to get down to business. And all you want is a space with a cafe, terrace, workable living room, rooftop and collab space—is that too much to ask? Actually, it isn’t! Betahaus has you covered. They even offer Skype Booths to call home on. With a community of over 230 freelancers and entrepreneurs in their community from 45 countries, you’re also bound to make some news pals to sink some sangria with post work. Worried about what you’ll do when the tum starts to grum while you’re co-working? A rooftop restaurant should do the trick, right? B-Building Business takes co-working to the next (gourmet work-side snack) level. They offer a herb garden for you to peruse, an expansive coffee lounge, alfresco meeting spaces and a gym to boost those creative juices. Hang around for a ping pong tournament or two and kick it with the locals. Ahoy! gets its nautical name because it ‘likens the new startup economy to the open sea with it’s strong currents and unpredictable weather’. 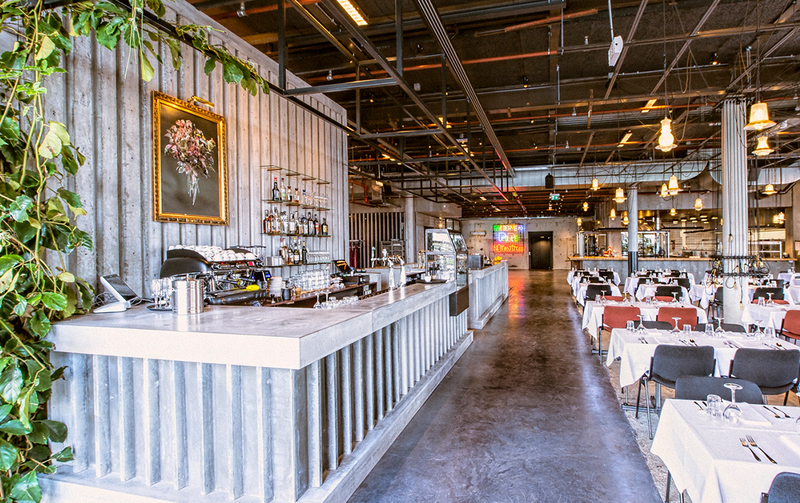 The sprawling 4,500 sqm space was founded in 2012 and boasts large meeting areas and cozy hang out spots as well as foosball and ping pong tables to let off steam. The hub is well connected with collaborators and investors in the tech world and it offers members additional services like event management and legal advice. And if you ever find yourself in Brazil, they’ve also got a sweet space in Sao Paulo. Punspace connects startups, online marketers and web developers with photographers, bloggers and writers. It's the ultimate networking hub. And you can imagine how many wordplay fanatics travel abroad just to work within these walls (who can blame ‘em?). Modern interiors and drop lights galore it’s urban cool and we dig it. They’ve also got three locations across the city and are open 24/7 for members. Splashed all your cash on travel and now need help boosting your funds? Check out these money-saving podcasts.